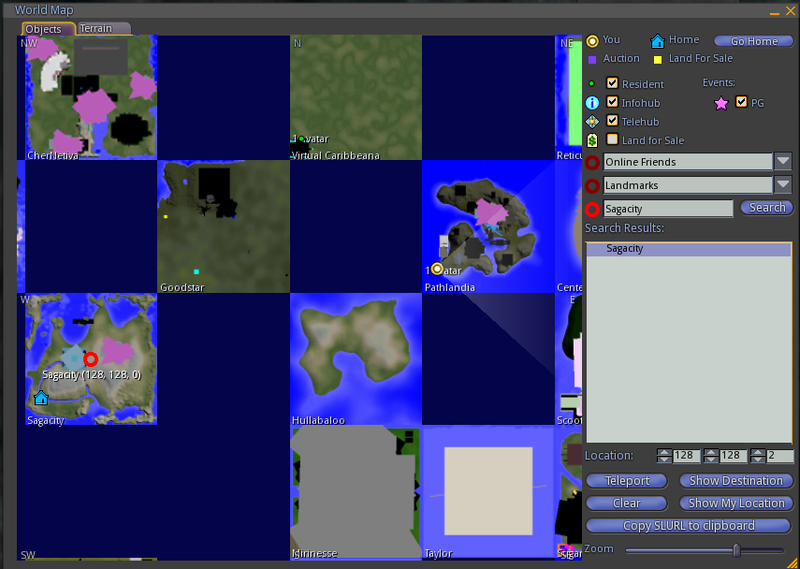 What’s more fun than discovering a new virtual grid to explore? How about jumping from new grid to new grid to new grid – carrying your avatar and your inventory with you as you go? Such was the case last night at John Lester’s (@Pathfinder) first meeting of the Hypergrid Adventurers Club. 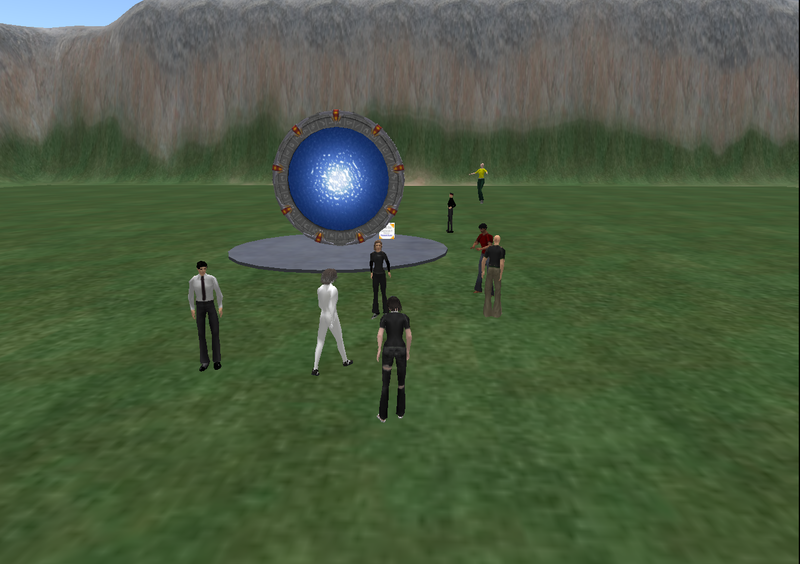 A hearty group of roughly 20 avatars gathered Sunday evening at Pathfinder’s new home on JokaydiaGRID. We sat around the circle, introducing ourselves and sharing insights/questions about this brave new world we’re all entering. Talk turned technical pretty quickly . Though much of it was over my head, I enjoyed marinating in the general atmosphere of a group of smart, energetic, and open-minded folk ready for whatever the next iteration, the next dimension, the next adventure might bring. John gave us each a notecard with instructions and the addresses (which look a bit like urls) for three different grids. We discussed the basics and we were off. You open your world map, type (or paste) the address in the search field, locate it on the map and press the “teleport” button. Whoosh. We traveled easily and safely to the three new worlds, the last of which – Aqualand – was the most stunning. Here are some amazing pictures taken by Chimera Cosmos (@LDinSTL) that capture the feel of it. John Lester’s blog, Be Cunning and Full of Tricks, describes our adventure and provides the local-chat transcript from our session. So what does this mean exactly? First, a bit of background, for those unfamiliar with the concept. OpenSimulator (often referred to as “OpenSim”) is an open source server platform for hosting virtual worlds. So anyone with a server and a bit of elbow grease can run their own virtual world, right there in their own living room. The virtual worlds that OpenSim simulates look a bit like Second Life – only rougher, less built up and refined. And of course, less populated. You access these OpenSim worlds through any number of specially designed “viewers” – in this case, we used Imprudence. OpenSimulator can operate either in “standalone mode” or in “grid mode”. In standalone mode, a single process handles the entire simulation – this works fine for a small number of users. In grid mode, various aspects of the simulation are separated among multiple processes, which can run on different machines (better when you expect to have a growing number of users). 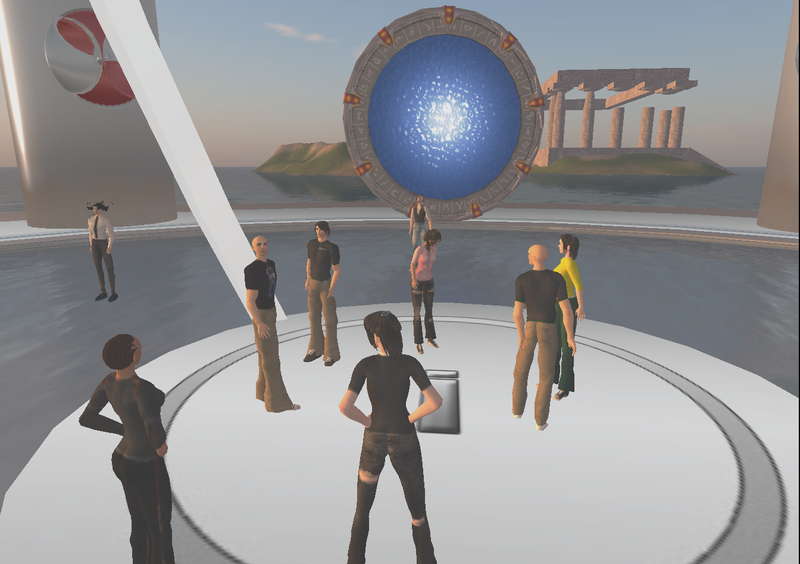 And here’s the really exciting part (that we took advantage of last night) – OpenSim uses an architecture known as “Hypergrid“, which allows avatars to teleport between different OpenSim-based virtual worlds, no matter where they are housed. Think of it like hyperlinking between web pages, but in this case, you are hyperlinking between worlds, each one run by others. The analogy I’ve been using to sort it out myself is that it’s like a school (bear with me, this isn’t perfect…). Up until now, we’ve had the fairly standard option, once you’re in the “school” (Second Life, Reaction Grid, Teleplace, SpotON3D), to easily wander (teleport) from classroom to classroom and visit other students working in those classrooms on the same campus. But with this, you can just as easily wander (teleport) from school to school, visiting “students” in other countries, working in a way completely different to you. In other words, it just got a bit more complicated….and infinitely more interesting. And what is the significance of this? This opens up the possiblity that individuals or businesses could have their own virtual worlds (running on their own servers) and still interact with customers, clients, or colleagues in other virtual worlds. That means security/protecting your intellectual property without cutting yourself off from community and networking. It also means movement away from centralized services to a decentralized (democractic?) model where avatars and ideas can flow freely. It’s a brave new world out there. Thanks, Pathfinder, for helping us navigate the, er, path. Late add: Just found this hypergriding glossary that might be useful. Welcome. This blog is about teaching and learning. Tools and resources. How to’s and why not’s. It’s a good place for me to think out loud. Thanks for being here.